When Berry Gordy founded Motown Records 50 years ago, it was little more than an All-American hustle; Gordy was among the many who tapped into the burgeoning entertainment industries of the post-World War II period of which Rhythm and Blues music was a vital part. That Motown has become, arguably, the most well known Black brand of the 20th century, it goes without saying that Motown’s success elicited great pride among African-Americans, who at the time of the label’s founding, were still struggling to gain full citizenship. Gordy himself was conscious of the larger meanings of having a successful black owned business, but he was also cognizant of the limits of using that success in support of a political agenda more in line with that emerging in the American South at the time in the form of the Southern Christian Leadership Council (SCLC) and the Student Non-Violent Coordinating Committee (SNCC). Because Gordy was not more outspoken about the Civil Rights and Black Power Movements, Motown has been, perhaps unfairly, depicted as marginal to the real struggles that took place. Gordy was always clear that he was producing music, not simply for black audiences, but for American youth—he was after all simply selling records. But Motown was never simply about selling records—Motown’s primary product was a view of Black America as cool, sophisticated, glamorous and vital to a nation that desired to view itself the same way. In this regard, it is hard to decouple, say the image that Jacqueline Kennedy transmitted to the world, from the sounds and images that Motown transmitted to that same world. Berry’s commitment to the “struggle,” as it were, occurred on much lower frequency—Motown’s artist would always be representative of the best that Black America could offer for the world and in a society in which there were few “authentic” representations of black life and culture, Gordy’s efforts set a clear standard. As scholar and critic Daphne Brooks describes it, Motown’s look was about “aaffirming black dignity and humanity amid the battle to end American apartheid.” More visibly, Gordy distributed the speeches of Rev. Dr. Martin Luther King, Jr. and Stokley Carmichael, among others, via Motown’s Black Forum imprint. Besides the fact that Motown was a vital part of Black Detroit’s economy, the aforementioned efforts amounted to the extent of Gordy’s political engagement and his politics and his music rarely mixed. One clear example of Gordy’s desire to draw a line between politics and selling records is the oft-told story of his reluctance to release Marvin Gaye’s recording What’s Going On. But Gordy’s resistance of Gaye’s recording had less to do with the album’s political content, and more to do with the mogul’s belief that Gaye had achieved a level of crossover appeal—Gaye’s “I Heard It Through The Grapevine for example was Motown’s best-selling single, at the time—that Gordy felt would be compromised by a “protest recording.” And even more to the point for the ever-pragmatic Gordy, he didn’t feel there were any successful singles that could be mined from What’s Going On. In reality though, in the years before the release of What’s Going On, Motown’s slowly began to reflect the political tenor of the times, particularly after the departure of the production team on Holland-Dozier-Holland in 1967 and the emergence of the late Norman Whitfield as the primary architect of the Motown soundscape. Whitfield’s production on Temptation’s classics such as “Cloud Nine,” and “Ball of Confusion,” (with Dennis Edwards installed as the new co-lead) and Edwin Starr’s “War” were as politically relevant as any of socially conscious music coming from the Stax and Atlantic labels or out of Haight-Ashbury (Sly and the Family Stone’s base). Even the choice of The Temptations to cover “Ol’ Man River,” given the song’s long association with radical black activist Paul Robeson, had distinct political connotations. Indeed without the collaborative work of Whitfield and primary lyricist Barrett Strong and Gaye’s What Going On, there would have been little context for the politically sophisticated work produced by Stevie Wonder in the mid-1970s. And while both Gaye and Wonder struggled mightily with Gordy—then with designs on establishing Motown as a <?xml:namespace prefix = st1 ns = "urn:schemas-microsoft-com:office:smarttags" />Hollywood brand—to gain the artistic freedom that marked their transitions from hit-makers to full-ledged artists, there is no denying Motown’s music offered a meaningful musical backdrop for hard-earned social gains witnessed by Black Americans in the late 1960s and 1970s. The 12-inch recording of Public Enemy’s “Fight the Power,” from the soundtrack of Spike Lee’s film Do the Right Thing was released on the Motown label in the summer of 1989. Arguably the track was the most incendiary political recording in the Motown catalogue at the time of its release. Motown’s release of “Fight the Power” occurred a year after Gordy has sold the label and Motown was very much in the business of establishing its legacy as a quintessential American brand. Nevertheless the label was still committed to releasing music that was relevant to young Black Americans. It was in this context that the label signed a then little known production collective from New Jersey known as Blaze. 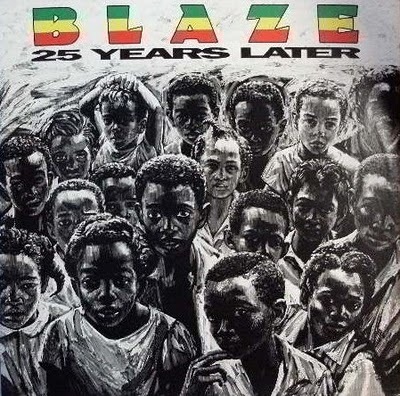 In the fall of 1990, Blaze released their only Motown recording, 25 Years Later. In a period that was marked by renewed expressions of black pride and Afrocentric thought, 25 Years Later essentially recalibrated Motown’s relationship to the legacy of black struggle, by wedding the classic Motown sound with post-Civil Rights era black nationalism. 25 Years Later was released at a time when mainstream black popular culture was dominated by so-called conscious rap acts like the aforementioned Public Enemy, KRS-One (whose brilliant Edutainment was released the same year as 25 Years Later), the Five-Percent nations musings of Rakim (with Eric B), Brand Nubian, and Poor Righteous Teachers and the decidedly Womanist politics of Queen Latifah as well as the DIY cultural nationalism of black filmmakers like Spike Lee, Matty Rich, Julie Dash, Robert Townsend and Haile Gerima. As such 25 Years Later was an earnest attempt to capture the full complexities of the moment by mixing snippets of melodramatic exchanges with inspirational music that covered the full gamut of black popular music. In many ways 25 Years Later was a precursor to a Web 2.0 phenomenon like R. Kelly’s Trapped in the Closet. Particularly remarkable about 25 Years Later, as political scientist Richard Iton notes in his recent book In Search of The Black Fantastic: Politics and Popular Culture in the Post-Civil Rights Era, is that it was recorded at time when R&B as a genre had retreated from political themes, allowing hip-hop to carry the water for a popular black political perspective. For a generation that had come to romanticize about political struggle, 25 Years Later offers an unglamorous view of the struggle and sacrifices that political activists often face, beyond the more obvious challenges. Given those dynamics, it’s not surprising that 25 Years Later concludes with the assassination of Shaheed Muhammad by members of the WPO (presumably the White People’s Organization). The final words on the recording are “Keep Hope Alive”—still relevant to African-American audiences, before it became more identified with the general caricaturing of Civil Rights Era veterans like the Rev. Jesse Jackson, who helped popularize the term. The final track on the recording is the largely instrumental “The Hope Song” which includes the utterances of Nelson Mandela, who notably was released from prison in 1990. 25 Years Later will not be remembered as the best that Motown’s legacy has to offer or even the best that Blaze, who have gone on to be stars of the underground House Music and Gospel House scene, had to offer. 25 Years Later is yet another reminder, though, of Motown’s historical role in providing the music and the cultural cover for Black American demands for social justice and equality. Dr. Mark Anthony Neal is the author of several books on music and popular culture, including the forthcoming Looking for Leroy, which will be published in 2011 by New York University Press, and The TNI-Mixtape which will be available on-line for free download later this year. Neal is a Professor of African and African-American Studies at Duke University.